For the hands on bride, who just needs assistance with making sure her wedding day runs smoothly. For the hands-on bride who just needs assistance and guidance in creating her fantasy wedding. A full service package, complete with a personal bridal assistant and consultant/coordinator. 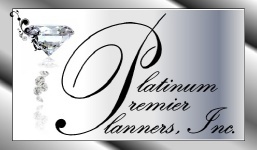 Welcome to Platinum Premier Planners, Inc., the only event planning outfit to plan your one-of-a-kind event! Not only do we offer an amazing variety of event options and full services, but they are completely personalized. We want your event to be YOUR EVENT! In order to make that possible we provide customized planning…everything, right down to the facility and our combination of classic and modern decor itself, to fit your needs! Our mission is to provide the foundational elements of a successful business and facilitate the highest standards of excellence and professionalism. It is our vision to assist individuals, couples and companies in maximizing their wedding and events. We have extensive experience and assist in providing creative, exciting, original and extraordinary ideas to assist our clients in creating a custom and unique event. We are proud members of the Association of Bridal Consultants, and although Platinum Premier Planners is located in Milwaukee, Wisconsin, we are availabe to travel to various destinations outside of Wisconsin to provide exceptional services.